If you’re reading this, odds are you’re not intimidated by technology. For one, you’ve grasped the notion that despite big data’s deafening roar, decisions based on more information won’t ever dent your productivity. But another thought, with bigger implications, is about adaptation. It’s about how you manage change when your customers have just as much information as you do. In the same article, the authors mention the notion of “absolute value,” which basically means there’s less gray area left before your customer decides whether your product is good enough. That’s OK though, use it to your advantage. 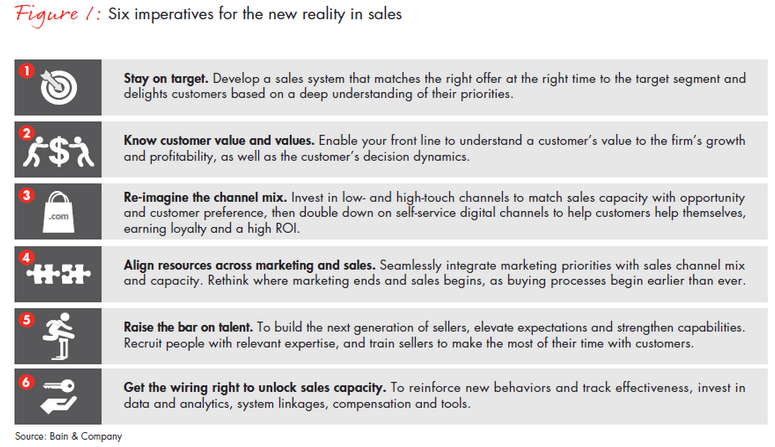 In a recent report, Bain said 60% of the companies they surveyed (550 total) said sales reps don’t do a good enough job differentiating their company. That’s a great example of sales fundamentals trumping glitzy technology. It’s a situation where you can match your knowledge against the wits of your competitor. As nerve-racking as it can be when customers are piloting products seconds after a credit card transaction, there’s plenty of ways to wedge yourself into the process. Here’s a few areas to focus on in the context of Bain’s findings. IT doesn’t lead all the technology purchases anymore. Business units have a lot of autonomy, especially when it comes to solutions that drive efficiency and increase productivity. Take all your data and intelligence and apply it to discrete business processes, not just the business as a whole. You can bet there’s a specific situation that’s led a business unit to think it can circumvent IT. Hone in on that and build from there. Think about innovative business models that are impacting how customers buy. The procurement process hasn’t changed, but customers are adapting to newer business models that provide more flexibility and less lock-in. The cloud, for instance, has changed the way customers can introduce capabilities to the organization. Part of your pitch these days might be crafting the right coexistence strategy with another product you once viewed as a competitor. Just because you’re selling against a broader solution or package doesn’t mean you can’t add value. Data showed 60% of companies weren’t targeting customer segments effectively. This has to be the lowest of the low-hanging fruit for sales reps. With intelligent templates and analytics to measure feedback loops, there’s not much of an excuse for a one-size-fits-all approach. Just 35% said marketing and sales had alignment. This is the time when you’ve got your own internal selling to do. We’ve talked about the ROI of having the right support in place, but what Bain refers to is — wait for it — “smarketing.” Eventually, they say, there won’t be any distinction between sales and marketing, leaving one function to “synchronize coverage and resources with target customers.” Sounds warm, doesn’t it? Either way, it’s your job to make sure the smarketing machine adds value at every turn. That creates more opportunities and touch points for you. Nearly one-third of executives said most of their reps don’t have the “requisite skills.” This gets back to the overall argument of staying relevant with the right mix of technology know-how and sales savvy. Not to oversimplify, but what’s often undervalued is the importance of communicating with your customer. Having a bevvy of tech tools at your disposal is only part of the equation. I can train any rep on the latest app or collaboration tool. A better investment is to spend time on where they’re applicable. Once a rep internalizes an effective approach and can accelerate it with the right tools, watch out. 75% have made significant investments in technology—but less than a third have seen a significant lift to sales effectiveness. Besides perking up vendors, this is an area where a rep’s productivity really comes into play. You were hired because you’re good at selling, not crafting proposals or being the resident Sharepoint administrator. Every quarter work with management to audit your sales tools and technology portfolio. It’s a good opportunity to see what’s working and make incremental changes over the course of the year. When firms aren’t noticing an uptick in sales effectiveness, it’s usually not the tools or technology. You know how you create work product and if it’s taking up too much of your time, it’s an organizational issue. Run it up the chain and let people know. The other thing I thought Bain nailed was the point about specific expertise. Basically, the days of reps rehearsing features that map straight to customer needs are numbered. Robots and algorithms will do some of it and customers will self-obtain the rest. The sales pros that are left won’t see a tumultuous world of technology, they’ll see the opportunities that exist when sales skills meet tech-driven intelligence.